The National Chamber of Pharmacists is an institution encompassing all pharmacists carrying out their profession in Metropolitan France or in the overseas departments and collectivities. to contribute to promoting public health and the quality of treatments, particular the safety of professional actions. 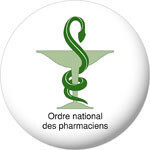 The National Council of the Chamber of Pharmacists is the custodian of professional legality and integrity (Article L.4231-2 of the Code de la santé publique). It is qualified to represent pharmacy, in its field of activity, with the public authorities and assistance bodies. It may exercise all rights reserved for civil actions before all jurisdictions relating to circumstances involving a direct or indirect prejudice to the collective interests of the pharmaceutical profession. It organises the implementation of the Pharmaceutical record. The National Chamber of Pharmacists has the structure of a National Council with seven sections, each managed by a Central Council. Each section represents one of the pharmaceutical professions, with the exception of sections E and D.
Where a Council sits in a disciplinary chamber, it is presided over by a magistrate from the administrative order (in the case of the National Council, by a State Counsellor). This Council manages and represents pharmacists employed in community pharmacies, deputy pharmacy owners, owners following the death of an owner, temporary employed pharmacists; employed pharmacists or pharmacy managers in co-operative pharmacies and in regional mining social security insurance offices (CANSSM); pharmacists responsible for dispensing medical gas in the home, consulting pharmacists for the Health Insurance scheme, pharmacists associated with centres and structures having mobile treatment teams for individuals at risk or in a situation of exclusion ; as well as all pharmacists not liable to belong to one of the other sections. In order to work in their profession, all pharmacists must be registered on the register of the Chamber of Pharmacists. Phone: +33 156 21 35 70 ; Fax : +33 156 21 34 29.